Cris Militante was still in college when he realized how much he wanted to teach. The computer science and information technology student said 3 of his classmates at the University of San Carlos (USC) in Cebu City had asked him to tutor them in programming lessons, which they struggled with. The 3 subsequently passed the courses. The positive results encouraged Militante to tutor other students who needed help with complex, specialized classes. Even though student organizations offered tutorials, not everyone could be accommodated. That inspired Militante and classmates Patrick Dave Woogue and Gabriel Andrew Pineda, with mentor Patrick Wilbur Aldueso, to come up with an online tutorial system. The application leverages on a mobile platform that allows users to act as student-tutors to those having difficulty with their lessons, thus stimulating collaborative learning within the school. The team called the app Eryl, a Welsh unisex name that means quiet, discerning, observant, seeking new challenges and opportunities. TRAINING. Cris Militante during the Seeds for the Future graduation. “Eryl is the brainchild of college students with common academic challenges, especially with major subjects,” explained Militante. With the solution, users can select from a pool of tutors, sort out schedules, and negotiate tutoring fees. Last year, Militante’s team entered Eryl in the 14th SWEEP Innovation and Technology Awards competition organized by Smart Communications – and won top honors. SWEEP stands for Smart Wireless Engineering Education Program. Launched in 2004, the competition draws out students’ ingenuity in developing wireless applications. The first prize, also called the Huawei Prize for Excellence, came with P300,000 cash and support from Smart, thus enabling USC to develop Eryl into a full-blown application. 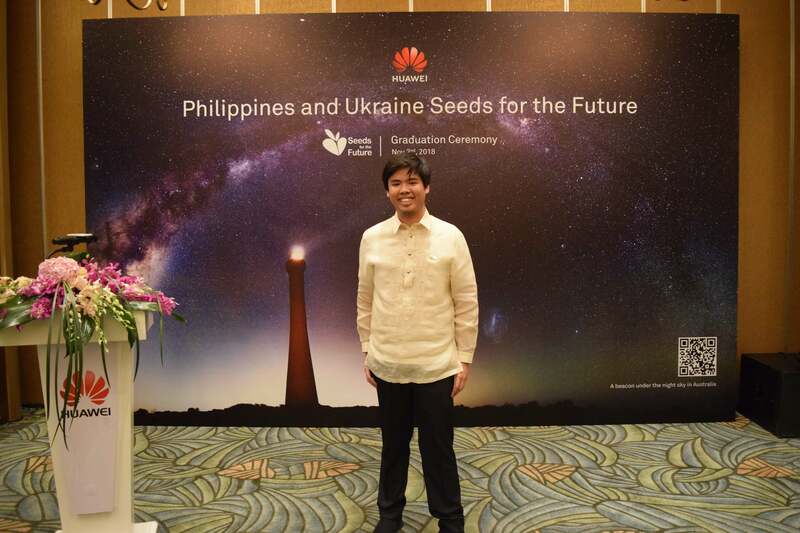 As team leader, Militante also received an additional perk: a visit to the head office of Huawei Technologies Co. Ltd. in China, to participate in the Seeds for the Future training program of the telecommunications equipment and consumer electronics manufacturer. The elite ICT skills initiative seeks to develop local ICT talent, enhance knowledge transfer, promote greater interest in the telecommunications sector, and improve regional building and participation in the digital community. “I enjoyed the technical and practical IT lessons on the cloud and 5G, especially as Huawei shared extensive expertise and equipment for us to experience how these new technologies work,” Militante said. Initiated by Huawei in 2008, Seeds for the Future program has had 3,600 top college students from over a hundred countries and regions. SWEEP representative Cris Militante (back row 2nd from left) with other Seeds of the Future delegates. Amid all his good fortune in being able to further develop Eryl and work on projects as an IT consultant, Militante never lost sight of his goal: to teach. He is now a computer science instructor at USC, where he shares with his students the insights he acquired from SWEEP and the Seeds for the Future program. Militante will also return to the SWEEP Awards this year, but will be on the other side of the annual competition – as a coach. More than technical knowledge, he hopes to impart three important lessons to future developers: envision, collaborate, and persevere. “Envision and set the goals you want to achieve, collaborate with people who share your vision, and persevere until everything becomes a reality,” the now 22-year-old professional explained. The SWEEP alum admits that teaching is not easy, with various roadblocks to fully understanding a fast-paced industry such as ICT. Nonetheless, he is encouraged whenever he sees firsthand the smiles of the students who have been enlightened by a lesson he taught. “My goal is to encourage these future innovators to keep pursuing their dreams and help them learn more about the field they have chosen – the same way winning the SWEEP Awards helped me reach my goals,” he said. It is a timely message, with this year’s SWEEP Awards in full swing. With the theme “#FutureReady: Creative Innovations Beyond Imagination,” it includes advanced categories for IoT and 5G solutions. The revolutionary concepts of the top 20 finalists will be developed into full-blown applications at a SWEEP Boot Camp to be held in Metro Manila this month. These include bids from Asia Pacific College, Batangas State University, Bicol University Polangui Campus, Camarines Sur Polytechnic Colleges, Malayan Colleges Laguna, Mapua University, Polytechnic University of the Philippines – Sto. Tomas Branch, Technological University of the Philippines, National Teachers College, and University of the Cordilleras (Luzon); University of Cebu – Banilad, University of San Carlos, University of San Jose – Recoletos, Holy Cross of Davao College, University of Southeastern Philippines, and University of the Immaculate Conception (Visayas and Mindanao). Final judging and awarding of cash prizes totaling over one million pesos will be held in May. For more information on SWEEP, visit www.facebook.com/sweepschools or www.facebook.com/smartcommunities.